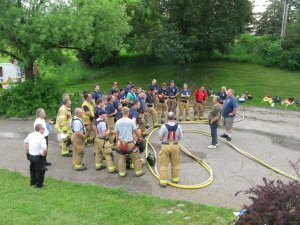 The Loretto Fire Department (Minnesota) hosted a live burn, last Saturday, with the neighboring fire departments and invited the Fireaway sales and marketing team to demonstrate the Stat-X First Responder® portable fire suppression product at their live training burn. Two demos where conducted in the upper bedroom both with successful suppression. 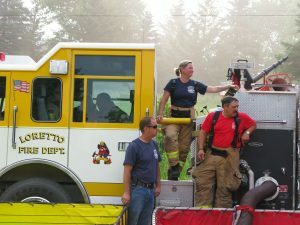 The Customized Fire Rescue Training team of fire instructors oversaw the demonstration. We’d like to thank the fire chief for inviting us to show how our product is a great additional tool for the first at the scene of a live fire. The Stat-X First Responder is a hand-held unit with a pull actuator designed to be tossed into an enclosed space with an active fire to provide immediate fire suppression.